The Cincinnati Interfaith Workers Center (CIWC) was established in March 2005 to mobilize, educate, and organize low wage and immigrant workers to achieve positive systemic change. The goal is to provide workers with the tools and support they need to transform their workplaces and communities as a whole. 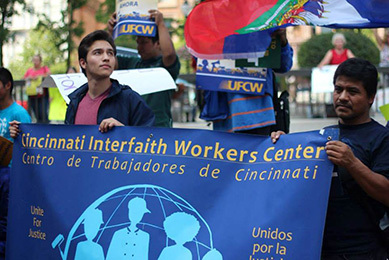 El Cincinnati Interfaith Workers Center (CIWC) fué establecido en marzo de 2005 para ayudar a movilizar, educar y organizar los trabajadores con bajos salarios y los trabajadores inmigrantes para lograr un cambio sistémico positivo. El objetivo es proporcionar a los trabajadores las herramientas y el apoyo que necesitan para transformar sus lugares de trabajo y comunidades en su conjunto. Subscribe to the CIWC's mailing list! CIWC is a membership based organization. Our members, volunteers, 2 staff, and board of directors keep our organization alive. Facing issues in your workplace? Interested in worker justice? Get involved. Become a member or volunteer and donate today!